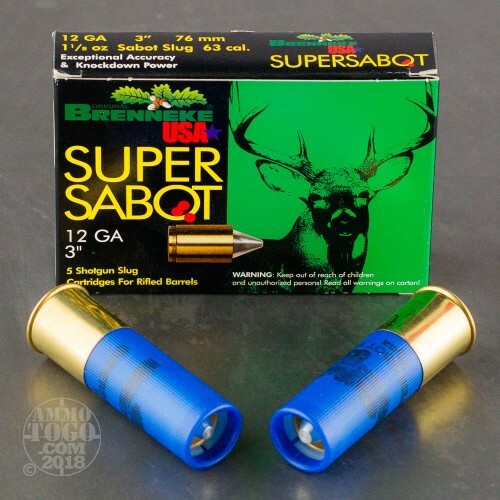 This is 12 gauge Brenneke Super Sabot 3" 1 1/8oz. 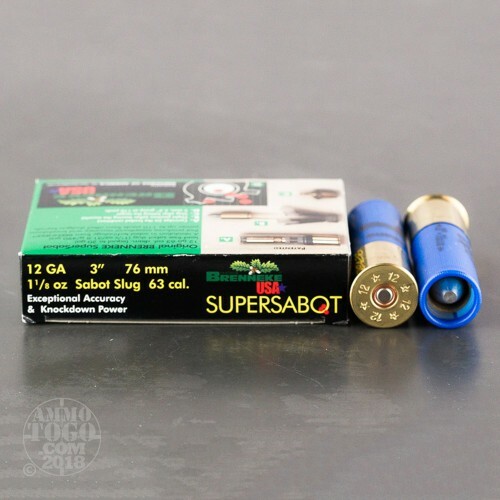 Sabot Slug Ammo. This ammo is a revolution in sabot technology from Brenneke that produces exceptional accuracy and knockdown power to distances up to 110 yards from rifled shotgun barrels. This is the most accurate and powerful sabot slug money can buy, you will not find a better sabot slug for the money. This ammo is packed in 5rd. boxes. What Does “Gauge” Mean in 12 Gauge? Shotguns and shotgun ammunition are classified by “gauge,” which is a measurement of the diameter of the barrel. Gauge is determined by the number of lead balls equal to the size of the bore that would be needed to weigh a pound. For 12 gauge, it would take 12 lead balls of the barrel’s diameter to weight a pound. The smaller the number in gauge, the larger the firearm’s diameter. 12-gauge shotguns have an internal barrel diameter, or “caliber,” of .729 inches. What is the Difference Between 12-Gauge Buckshot and Birdshot? 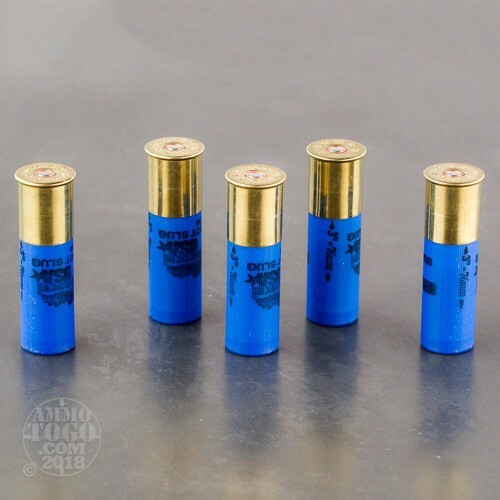 What is 12-Gauge Ammo Should I Select for Deer Hunting? 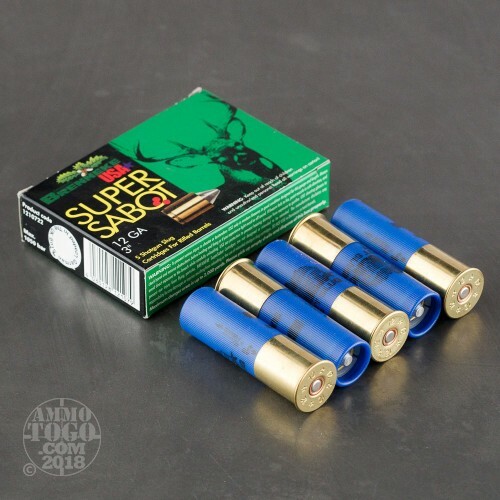 For deer hunting, you will want either buckshot or slugs. As we discussed above, buckshot consists of larger pellets for deep penetration, which is needed to reach a deer’s vitals. The advantage of buckshot is that you have a spread with multiple projectiles, so you are more likely to hit the target’s vitals. Slugs are a single projectile; essentially, a shotgun bullet. They have one solid piece, usually made from steel or lead, and they fire a heavy projectile that does maximum devastation to the target. Slugs are recommended when the shot is at a greater distance. Is 12 Gauge Ammo Reliable for Home Defense? There’s no question that a 12-gauge shotgun can do devastating damage to anyone threatening your home or family. The issue with 12-gauge is that it may actually be too much for home defense, as over-penetration is a real threat with this shotshell. The advantage of a 12-gauge is that they offer a spread, so you are more likely to hit a target in a tense, panicked situation. The disadvantage is that they have a lower shot capacity compared to many handguns. If you choose to protect your home with a 12-gauge shotgun, be sure to select an ammunition product made specifically for self-defense, which are usually buckshot loads with 2.75-inch shells.